Poor Luther's Bones - "Inside The Outsider"
These folks play simple mellow '60s country-folk/indie-rock that sounds kinda lazy at first, but its melodies are the kind that don't seem to catch on till after a few listens, I guess because main guy Garth Forsythe's vocals and others' performances are just "low-key" and often fairly derivative. Still, this latest listen has been pretty enjoyable. "Do It For Fun" has mellow horns, piano and a real nice vocal from Garth and bah-bah-baaahhh backing vox. Hmmm... that's basically what I wanna say about a lot of these tunes. "Vertigo Landslide" is some nice British-sounding mellow psyche with violin and organs, not really psyche in the "trippy" sense, just the '60s. "Hang Jaw" is cool, but a little too catchy and way too happy, upbeat old-timey piano-stompin' rock 'n' roll. But then "Black Nanny" is a very somber ballad with slow weepy country fiddle. "(That's What Keeps You) Goin' On" is my absolute favorite - heavy-handed lumbering psyche-rock that pounds the old Bevis Frond nail right in the gut, with somewhat pissy Britishy vocals, too. They're from rural Pennsylvania, though. "Holy of the Holiest" is more catchy country stuff, honky-tonk piano and fiddle again. "She Ain't You" is maybe a bit like Kinks, Beatles or Pretty Things... good stuff... as is "Isobel" actually - I think I'm getting it now. Look forward now to hearing more from these old bones, they definitely have something here that can be improved on the more they find their own style, and I'm sure now I'll be returning to this disc even though the review is done. For more information you can visit the Poor Luther's Bones web site at: http://www.poorluthersbones.com. 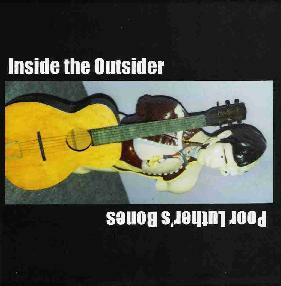 Inside The Outsider is distributed by Heavy G Records. You can visit their web site at: http://www.heavygrecords.com.